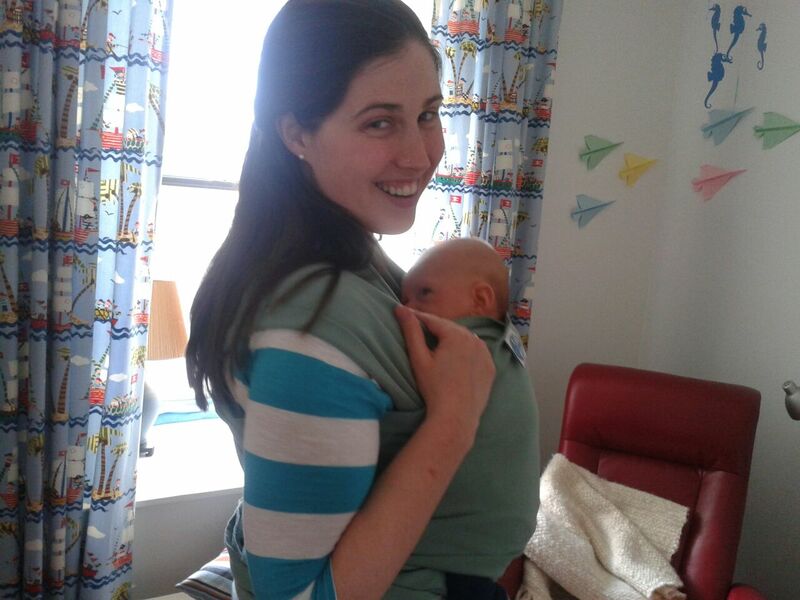 Earlier, I wrote about surviving the first weeks of motherhood. As I get the hang of this whole motherhood thing, I want to share with you a few more helpful lessons from parenthood. Note: these are some things that have really worked for me. Of course, every family and baby is different. Let me know in the comments if you had other tricks/recommendations that really worked for you. 1. Choose your visitors carefully. Even if you’re the most put-together, organized person, having good help when you have a baby is essential. All visitors are not created equal, however. Try to surround yourself with helpful, useful people whose goal is to make your life as a new parent easier. If you can, ask them to pick up groceries, or help you with cooking or a load of laundry. Limit visits from people who will expect to be entertained. If friends or family come over expecting a warm meal from you, they are sub-optimal postpartum guests. If you feel you must see these people, suggest a meeting outside of the home in a café or restaurant, and then do not invite them home for a coffee. Are you picky about the bed being made or the house being super tidy? Well, get over that. Parenthood does not necessarily mean that your life will become a disaster (I’m thinking of this comic from the Oatmeal–caution, strong language), but if you’re a neat freak, you may have to tone it down a bit. At the beginning, you’re going to want to sleep when your baby sleeps. If that’s in the middle of the day, so be it. It’s tempting to take advantage of a nap to throw on a load of laundry or do some dishes. But if you are sleep-deprived, forget it. Ask someone to do it for you (see point 1). Eventually, as things get more regular, and your baby sleeps better at night, you’ll be able to do more. This one can be tough for some and essential for others. It was essential for me. Our Bug needed to visit the hospital two days after he was born for a follow-up check, so in early January in Quebec, we bundled him into the ErgoBaby carrier and trekked over to the hospital. I was super stressed out about whether he was breathing okay, if he was warm enough, etc. But once that first outing was over and it went so well, Chico and I made a point of going out on an almost daily basis. Getting out of the house will help you in so many ways: it’s exercise, it’s a change of scenery, and it will likely knock your kid out for a nap. Sweet. 4. Make a bedtime routine. I have no idea if Chico and I just lucked out, or if it’s because we started a bedtime routine from early on, but our Bug is a champion sleeper (knocking on wood like crazy here). Starting at just a few weeks old, we got used to giving the Bug a nightly bath, and now it’s like a pavlovian response: his trigger is the bath, and his response is sleep. It’s amazing. Bath time is also a great opportunity for Chico to bond with the Bug. Chico is the Bath Master, and he and the Bug have a blast splashing around in the tub, and then giving and getting a massage. Little by little we are working on a daytime routine as well, in order to help Bug master the daytime naps. I’ll let you know how that goes. 5. Baby wearing is a lifesaver. Some people swear by it, and others say it’s dangerous to get a baby used to it, but our Bug loves to be slung in the Moby wrap. Sometimes he falls asleep, sometimes he doesn’t, but he always loves it. Sorry about the poor photo quality, but here’s me wearing the Bug. I read in “What to Expect the First Year” that baby wearing for a few hours a day can actually lead to a less fussy baby, and promotes bonding. Eh, whatever. All I know is that our Bug loves it, and he has even nursed in the Moby wrap like a champ. When he’s fussing and I have things to get done, I sling that baby like a badass and carry him around while I fold laundry, do dishes and get dinner ready (just don’t go putting anything in the oven while you’re wearing your baby, okay?). What lessons have you learned that made your life as a parent easier? Do tell in the comments!